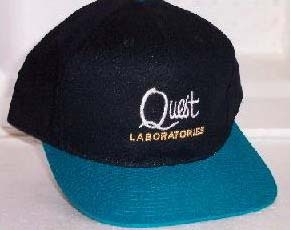 In the mid-1990s, a series of items were released under the "Quest Laboratories" brand, as if the items were made for people working with Dr. Quest in one of his labs. 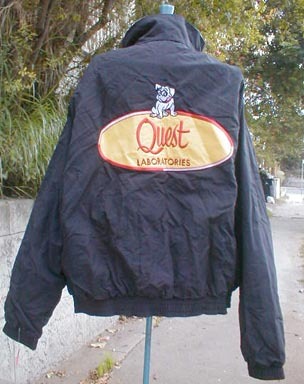 1995 Hanna Barbera Jonny Quest, Quest Laboratories jacket. Funnel neck. Elastic waist. Zip front with vertical waist/hip pockets. Fully lined with soft white cotton. 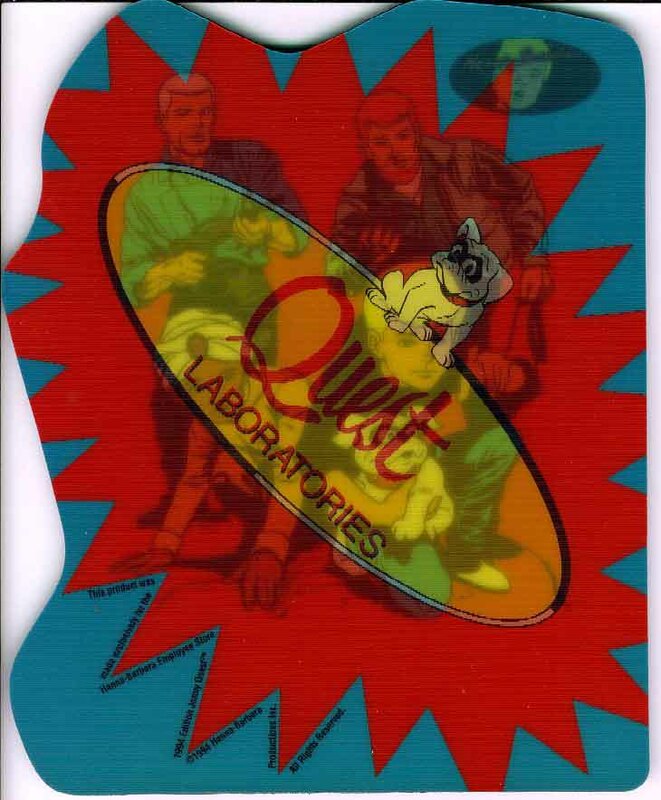 Small logo Quest Laboratories patch on front, Hanna Barbera Jonny triangle sleeve patch, and large Quest Laboratories with Bandit on back. 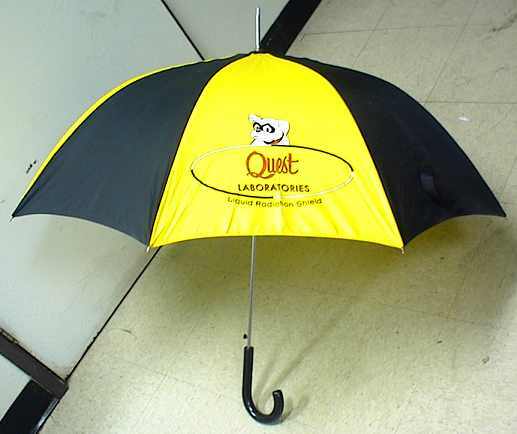 This full size Jonny Quest umbrella was sold in 1995 as an exclusive at the Hanna-Barbera Employees Store! 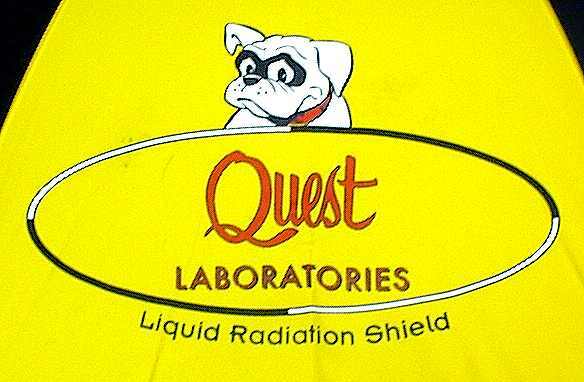 On one yellow panel is the Quest Laboratories logo (with Bandit), proclaiming this a "Liquid Radiation Shield"; on another "Made exclusively for the Hanna-Barbera Employee Store. 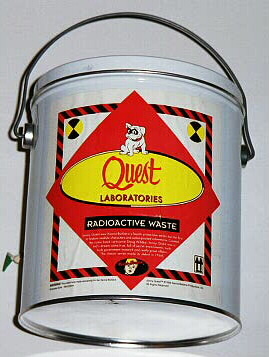 1995 Edition. Jonny Quest ©1995 Hanna Barbera Productions Inc. All Rights Reserved.," is repeated three times, ending in a giant raindrop. Pops open with a thumb switch on the handle, and has a closure strap to keep it rolled. 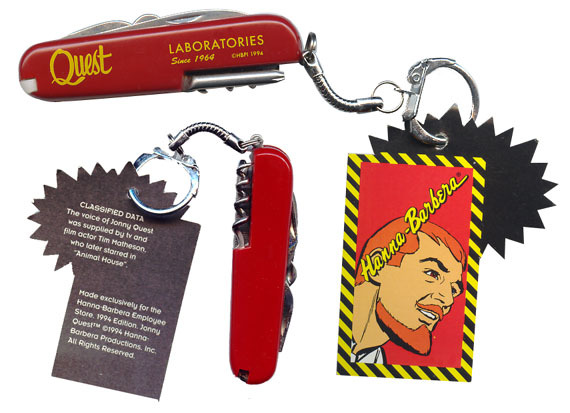 A Swiss-Army style pocket knife (3" long) with key chain, cork-screw, can-opener, knife blades, etc. 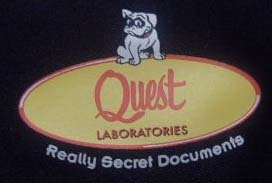 "Quest Laboratories - Since 1964 (©HBPI 1994)" printed on the handle. 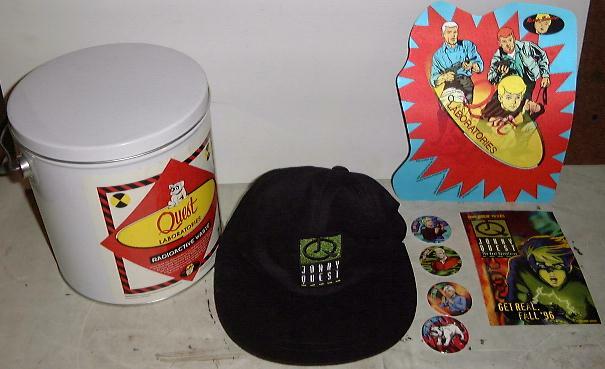 Hang-tag has H-B Logo and image of Dr. Benton Quest on one side, Jonny Quest trivia on other. 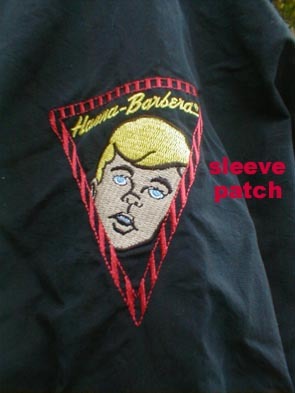 Tag says: "Made exclusively for the Hanna-Barbera Employee Store - 1994 Edition." 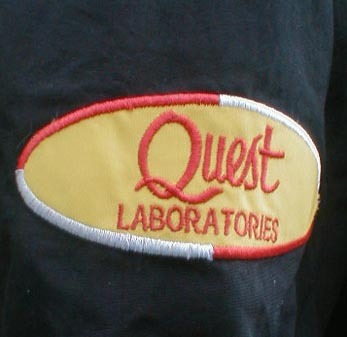 This view shows the "Quest Laboratories" symbol fading and the underlying characters showing up better. 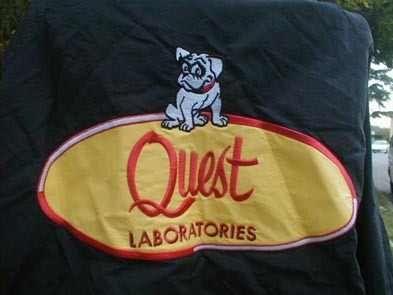 At another angle, you could see the Bandit-enriched Quest Laboratories logo. 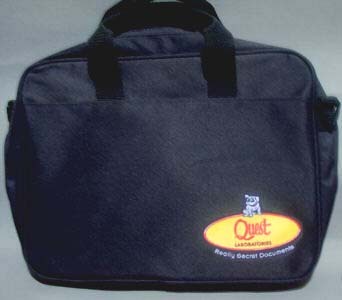 A soft nylon black satchel (soft sided briefcase) 15" x 12" x 3" with loop handles, an adjustable and detachable over-the-shoulder carrying strap, and inside divider. The divider has a penholder and two small pouches, one with a plastic window for business cards or the included "Classified Data" card. Inside is a label that reads "This product was made exclusively for the Hanna-Barbera Employees Store, 1994 Edition. 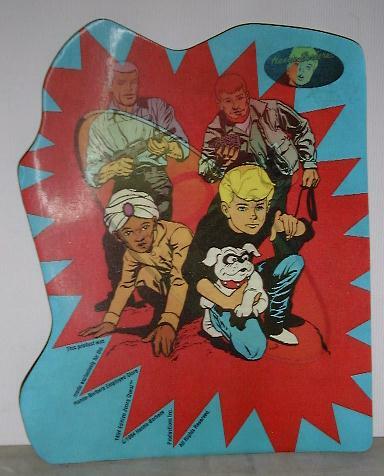 Jonny Quest, 1994 Hanna-Barbera Productions." 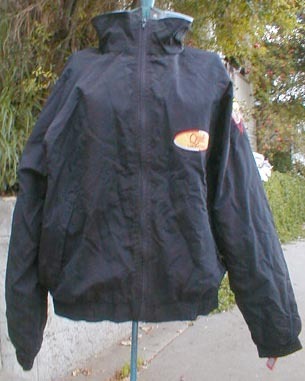 A second label says "MARKET WHOLESALES CO."
We picked this up on eBay, and it's almost certainly an unlicensed item. There's a tag for the manufacturer, LitePro, but no trademark or copyright notice.